Sometimes you just have to get out of Manhattan, even if only for a few hours and even if only to go as far as a different borough. This Sunday I did just that when Flaneur and I left the frat-tastic world of Murray Hill to go explore Brooklyn. And what better way to start off a Sunday morning than with brunch? The answer is there is no better way because every Sunday should involve brunch. 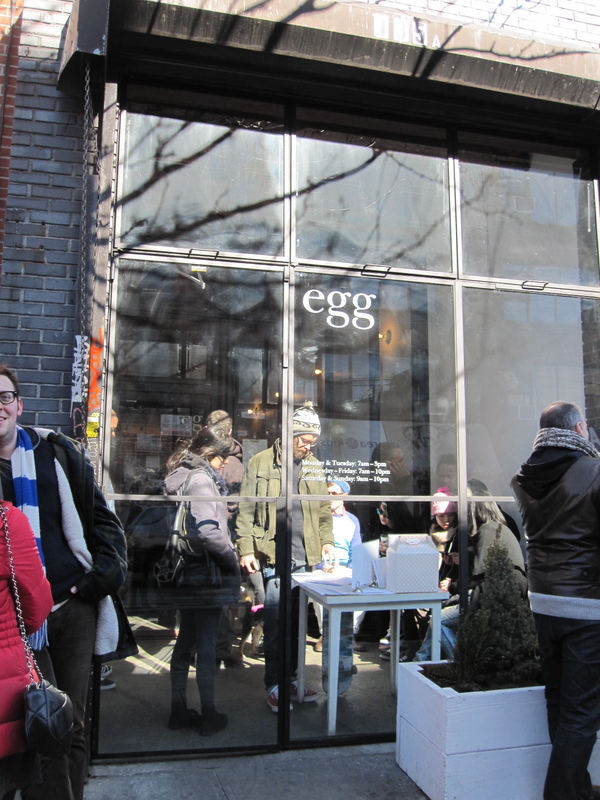 After consulting my trusted guide to, well, everything in life (Google) I found the perfect place: egg, in hipster haven Williamsburg, Brooklyn. It only took one menu item to convince me: biscuits and gravy. I will do cartwheels and somersaults for biscuits and gravy. It’s such a fatty, comforting, almost nostalgic food that I try and eat it whenever I see it, which isn’t often. 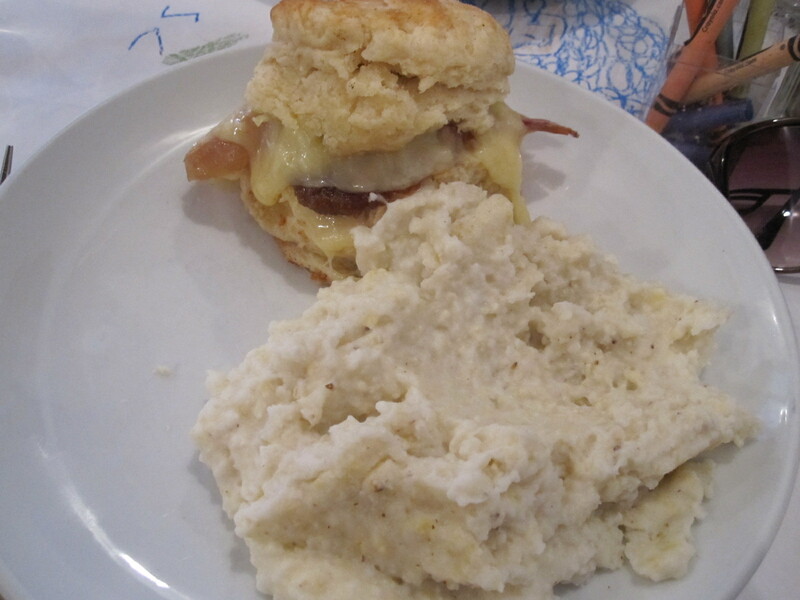 In Gainesville, biscuits and gravy were on any menu that included breakfast but not in New York City. I always search amongst the pancakes and French toast, the omelettes and the breakfast sandwiches but nothing. Sometimes they have biscuits, but no gravy. Must be a southern thing. When we got to egg (yes, it really is with a lowercase e), the small waiting area in the front was packed. Guys in skinny jeans, tattered sweaters and Ray Bans squeezed in next to girls with thick-rimmed glasses, funny shoes and in the case of one girl there, mullets. It was like a live commercial for Urban Outfitters. We wrote our name on the list and waited outside, enjoying the relative silence of Brooklyn compared to the constant cacophany of Manhattan, which most of the time appears to be concentrated outside my window. Maybe 30 minutes later, our name was called and in we went. My game plan from the beginning was biscuits and gravy. When I picked up the menu my eyes immediately went to them on the menu, first on the list. “Homemade buttermilk biscuits in sawmill gravy made with pork sausage or pan-seared mushrooms,” I read to Flaneur, bouncing my feet on the ground in excitement. But then my eyes wandered and saw something else. And then something else. And then something else again. Before I knew it, I was having second thoughts on the biscuits and gravy. Everything sounded so good. Why do I have to choose? Why isn’t there some kind of sampler breakfast feast? Why God why? 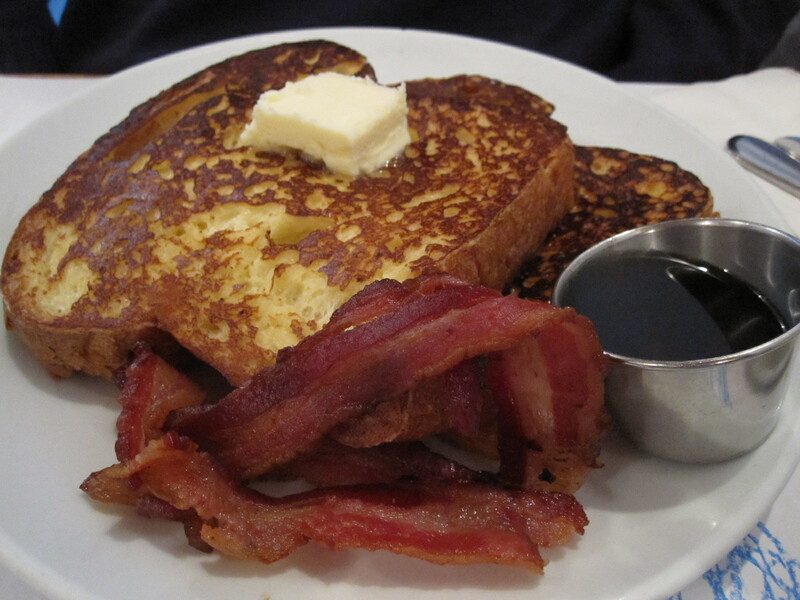 Flaneur sat there looking at me, already set on what he wanted: French toast and a side of bacon. Easy. Me on the other hand, I was in the midst of a crisis. “Are you guys ready to order?” asked our waitress, who seemed to have materialized out of nowhere, pen and pad in hand, ready to take our order now or never. Flaneur gave me a look. Pick something already, I’m hungry. Flaneur’s order was simple. It would only buy me about 15 seconds. I had to act fast. My eyes flew over the menu one last time, just as the waitress turned towards me. “Uhm, ok, well, uhh,” I started. Her look was bordering on a glare. “Great, thanks,” she said, collecting our menus and zipping off. While we waited, Flaneur and I drew on the paper tablecloth with the Crayons provided. He drew a head. I drew asparagus and the icing on a cupcake. Before I could draw the base, our waitress was back with plates in hand, leaving my half finished cupcake with its cartoonish swirl looking like a purple cartoon poo. I have to admit, when she set the plate down, it looked like something was missing, like it wasn’t as visually appealing as I wanted. Grits are never exactly great looking in general, so I felt a bit of food envy when I saw Flaneur’s plate and the fat French toast and thick strips of bacon sitting on it. Yet when I took the first forkful of grits, all my envy disappeared. These grits were delicious! They tasted worlds better than the instant mush I make at home. They actually tasted like corn! I had almost forgotten that’s what grits were made out of. They were thick but smooth, not too dry and clumpy, or too watered down. Almost makes you want to lick the screen doesn't it? 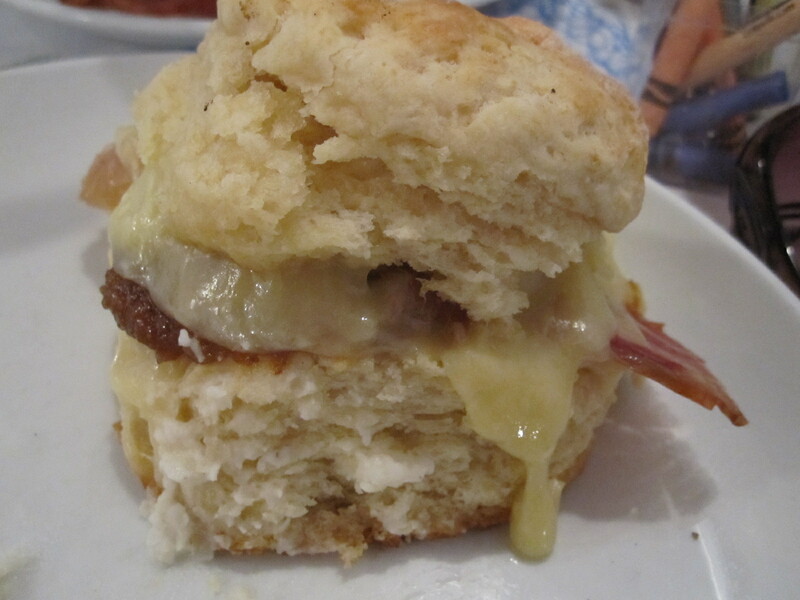 But the star of the show was definitely the biscuit sandwich. If you’re like me, and you like a mix of both sweet and savory, this is the way to go. The homemade fig jam added a subtle sweetness between the biscuit, ham, and the melted cheese that oozed down the side. During all that I did manage to sneak a bite of the French toast and it was pretty delicious too, soft and thick without being chewy. The menu said it was made with a slice of Amy’s brioche. I don’t know who Amy is but she deserves a pat on the back at the very least. A trip to egg was everything I could have asked for out of a Sunday: a welcome mini escape from Manhattan, a change of scenery, a slight twist on an old favorite, and a very delicious, belly filling brunch. And best of all, I now know where I can find biscuits and gravy, and it’s safe to say they’re probably awesome. This entry was posted in Breakfast/ brunch and tagged bacon, biscuits, brooklyn, egg, french toast, grits. Bookmark the permalink. Actually Angie, Yes, shamefully so- the last picture made me contemplate not licking the screen. I feel like your blog will be my fat kid version of Rick Steves, lol.